This isn’t your typical grilled cheese sandwich! 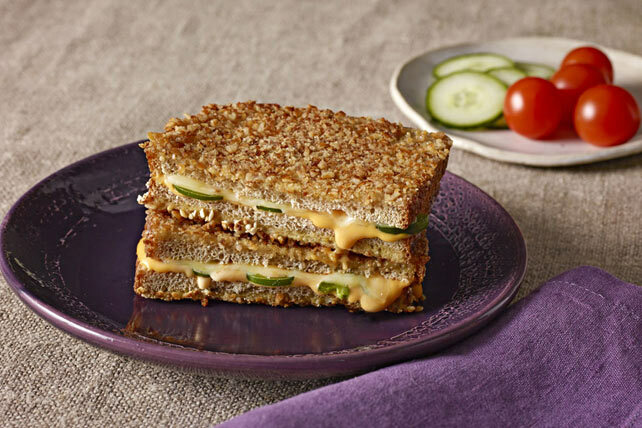 We’ve added two kinds of cheese, jalapeño pepper slices and a pretzel crust to this grilled cheese sandwich recipe. Give our Jalapeño Popper Melt sandwich a try! Place Monterey Jack cheese slices on 2 bread slices; cover with fresh jalapeño peppers, Kraft Singles and remaining bread slices. Whisk egg and milk in pie plate until blended. Dip sandwiches, 1 at a time, in egg mixture, then in pretzel crumbs, turning to evenly coat both sides of sandwich with crumbs. Melt 2 tsp. margarine in large skillet on medium heat. Add sandwiches; cook 2 min. or until bottoms are golden brown. Add remaining margarine to skillet; turn sandwiches. Cook 2 min. or until bottoms are golden brown and cheese is melted.